Got a question regarding private boat hire? We have tried to answer as many frequently asked questions, including the booking process and the amenities you will find on board during your cruise on the Thames, as well as more practical information like nearest transport. If however you can't find the answer to your question then please contact us either by calling 0800 019 15 16 or 01689 89 89 59, or by emailing us on info@cpbs.co.uk. You may also find our terms and conditions helpful. The boats are based at Temple Pier, opposite Temple tube station and Bar Salsa on Victoria Embankment. Please click here for full contact details. Can I view the boats before booking? Yes! In fact we recommend it. Boats on the Thames vary wildly in both style and presentation and we are convinced that a visit to our boats will convince you that we offer stylish boats at superb value for money. Do you go to Putney/ Kew/ Richmond/ Greenwich/ the Thames Barrier? We operate between Putney in the West and Gravesend in the East. Unfortunately we can not travel as far upriver as Richmond, Kew or Hampton Court. You can see our range and all the piers we can use on our River Thames map. What route will the boat take for my party? Routes on the day are tide dependant and at the Captains discretion but on a standard 4 hour cruise from Temple Pier we would normally head upriver slightly to have a look at the Houses of Parliament and the London Eye, before turning and heading downriver passing such sights as the Oxo Tower, Tate Modern, Globe Theatre, Millennium 'wobbly' bridge, Tower of London and Tower Bridge, Canary Wharf, Cutty Sark, Royal Naval College and Thames Barrier, before turning and heading back to Temple. Can we have the boat stationary / laying alongside the pier? Yes although we do not recommend it - after all you have hired a moving vessel. If you do wish to do so however there is an additional charge of £127.75 inc VAT per half hour or part thereof and this must be booked in advance with the office. Please see the laying alongside section of our terms and conditions for more information. Why have I been told my numbers are too low when they comply with what I can see on your website? The numbers given on the website are a general guide. In peak times the minimum number is higher, likewise in low season we may be able to accept parties with as few as 10 passengers onboard. If my numbers are too low for the boat of my choice is there any way I could still hire it? Yes we are sometimes able to add a low number surcharge to the client's bill or request for a minimum bar spend. Please contact us for more details. I've viewed the boat and I love it! How can I confirm my date? Great! Let us know and we will send you a link to our booking form to complete and return with a 25% non-refundable deposit to secure the date. You will also need to read through and accept our terms and conditions. Upon receipt of your form and deposit we will book the piers and any suppliers and then send you an acceptance letter. It is important to note that the boat is not booked when you send the form and deposit, but when we send you confirmation that everything has been booked. Until you receive this you must not start sending out invitations or selling tickets. When do I need to pay the remaining money? We will contact you about 3 weeks before your party to confirm any final details and send you out a balance invoice which is payable in full 14 days before your function. Yes, we accept both credit and debit cards. Can you provide a DJ and disco? Yes we can provide our resident DJ and disco for £300 (£250 + VAT) for 4 hours, please click here to calculate the cost for your function including the DJ and any other extras. Can I provide my own DJ and disco? Yes you can provide your own DJ and disco for a surcharge of £72 (£60 + VAT). Do you have DJ equipment we can hire? Yes all the boats have DJ equipment you can hire for £72 (£60 + VAT) per hour. Can we have two separate rooms of music? 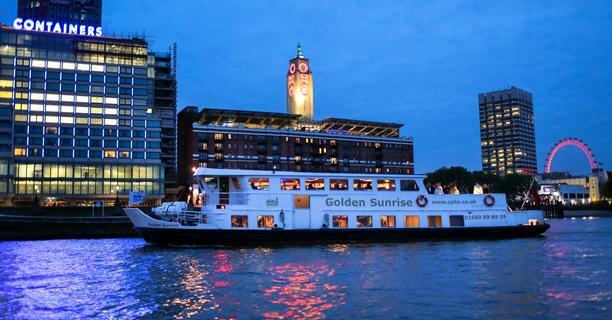 Yes if you hire our larger party boats Golden Jubilee, Golden Sunrise and Golden Flame you can have one DJ upstairs and one downstairs, creating either 2 dance floors, or one dance area and one chill out zone. We only have one set of equipment per boat however we can hire in additional sound systems if required for an additional cost. Is there a microphone we can borrow for our speeches? Yes there are generally microphones onboard all our party boats, please ensure you let the office know in advance so we can make sure it is available for you. Our microphones are best used for speeches and not for singing. What does the own entertainment surcharge cover? The own entertainment surcharge covers the cost of our music licences which we are required to have in order to play recorded music. Do we pay the own entertainment surcharge as well as the DJ equipment hire? No, if you are paying to hire the boats DJ equipment you do not pay the own entertainment surcharge as well. How much does your catering start at? Our buffets start from £12.60 per person (£10.50 plus VAT), a full range of the buffets, canapes, barbecues and silver service menus we can offer on board our party boats can be seen here. Can I bring on my own catering? Yes you can bring on your own catering for a surcharge of £1.20 per head (£1 + VAT) on the Golden Star, and £2.40 per head (£2 + VAT) on the Golden Jubilee, Golden Sunrise and Golden Flame boats. What does the own catering surcharge cover? On vessels equipped with a galley the surcharge covers use of galley, hob, microwave and some preparation space. It also covers waste disposal. For vessels without a galley the surcharge covers waste disposal. Do we have to cater for everyone onboard? Yes, everyone onboard must be catered for. If CPBS catering is chosen then special rates are generally available for children. Can we have linen and real china and silverware? Yes, if CPBS catering is chosen and you would prefer linen, real china and silverware instead of the normal banquet roll, paper plates and plastic cutlery, this can be provided for a small surcharge. This has to be hired by the caterers and so must be booked through the office at the time of booking the meal. What are your bar prices like? All the fully stocked bars on board our party boats sell a wide range of beers, wines, spirits and soft drinks at pub prices. Our full bar tariff can be seen here. Yes, as well as cash we also accept debit and credit cards on board. We do not accept personal or business cheques onboard the boats. How many bar staff will be onboard for our boat party? The number of bar staff will depend on the size of your party, a general rule of thumb is one bar staff for every 60 passengers. Can I set up a free bar for my guests? Yes you can set up an account for your guests, either prepaid in advance with the office, or paid on the night with cash, credit or debit card. Any accounts unsettled at the end of the party will be subject to a 10% handling fee. We do not accept personal or business cheques onboard the boats. What is the difference between an account bar/ minimum bar spend/ bar surcharge? An account bar is where you pay for your guests' drinks. You can set a monetary limit on the account and you can also limit what drinks are available. For instance you may decide to put £2,000 behind the bar but only allow beer, wine and soft drinks, in which case your guests would need to pay for any spirits themselves. Once the £2,000 is reached the bar manager will contact you and you will have the option to extend it if you wish, or the bar will revert to a cash bar. All account bars must either be pre-paid with your boat hire invoice or settled at the end of the function by card or cash. If a pre-paid amount is not reached on the night then this will be refunded via the same method that you paid within 7 days of your function. If a minimum bar spend is applied then the amount is decided by us, is payable by you prior to your function and is non-refundable. On the night the bar can either run like an account bar and your guests' drinks will be taken from this minimum bar spend amount and if the account does not reach the minimum bar spend amount then no refund will be given. If the minimum bar spend amount is reached then the bar will revert to a cash bar. Alternatively we can run a minimum bar spend with pay as your go bar where once again the amount is decided by us and is payable by you prior to your function. Guests will buy their own drinks throughout the event and the total bar spend will be deducted from the amount you pre-paid and refunded to you after the function. e.g minimum spend pre-paid £1000, total bar spend during the function £600, total refund to the client £600. A bar surcharge may be applied by us if your passenger numbers fall well below our seasonal limits or due to the nature of your function. The amount will be confirmed to you by CPBS, is non-refundable and is not a payment towards the bar spend on the night of the function. In some cases a minimum bar spend can be used in place of a bar surcharge. Can I buy drinks vouchers for my DJ's? Drinks vouchers can be purchased through the office prior to your function. Can we bring our own alcohol onboard? We allow corkage on wine and champagne by prior arrangement on weeknights only, for the current rates please click here. No other alcohol may be bought onboard under any circumstances. Does this include vodka jellies? Yes, unfortunately it does - sorry! Can we have real glasses? Yes, real glasses can be provided on some of our vessels on payment of a staff surcharge. This must be ordered in advance through the office. Please speak to the office for more information. What sort of decorations can I have onboard? We offer a variety of decorations including balloons and rope lighting to complement your function, please see our entertainment page for a full list. Can I bring on my own decorations? Yes you are very welcome to bring on your own decorations, all we ask is that nothing is used that might mark the boat (ie. nails, duct tape etc), and that no 'messy' decorations are used like silly string or smoke machines. For safety reasons we are also prohibited from having naked flames or similar onboard. A full list can be seen on our terms and conditions page. I want to put up decorations / set up the food, will I get time beforehand to do this? Yes, we try to offer 60 minutes before the party for you to set up. This is free of charge and is at Temple Pier. Please see our terms and conditions of our function guidelines for more information. Where is the nearest tube / rail / car parking? The nearest tube station to Temple Pier is Temple, which is on the District and Circle lines. Embankment and Blackfriars are also 10 minutes walk away. The nearest train stations are Charing Cross and Blackfriars, both 10 minutes walk. If you are coming by car then there is pay-by-phone parking on Victoria Embankment, outside the Salsa Bar, and behind Temple station. The nearest NCP is at Blackfriars, about 15 minutes walk, and there is also an NCP on the south side of the river at Waterloo. What time will my guests be allowed to board? The boat will open for boarding 15 minutes before the stated embarkation time. Therefore if your party is from 7pm to 11pm your guests may board from 6.45pm. Is there a cloakroom for our coats? All of our boats have a rail where passengers can leave their coats, as this is not monitored we do encourage people to keep their valuables with them. In line with current legislation all of the interiors of our vessels are non-smoking. Smoking is permitted on the open sun decks however. Do you accept credit and debit cards onboard your boats? Yes we accept card payments on all of our boats. Will there be tables set up onboard? Yes, unless you specifically ask us not to there will be tables set up on board.lThe tables can be covered with white banqueting roll at no extra cost, please let the office know if this is something that you would like. On the Golden Star there will be seating for approximately 48 people. A further three trestle tables can be set up in the middle of the boat for a buffet if required, or to seat a further 18 passengers. On the Golden Sunrise there will be tables set up in the lower saloon to seat approximately 40 people on the bench seating and removable chairs and more tables can be set up in the middle of the lower saloon if required. On the Golden Flame and Golden Jubilee there will be tables in the lower saloon to seat approximately 40 people on the bench seating and removable chairs, and there is also a small amount of bench seating in the upper saloons. More tables can be set up in the middle of the lower saloon if required. How many crew will be onboard? The number of crew onboard will depend on the vessel you are on, the number of passengers on board and the time of day, and can range from a minimum of 2 to a maximum of 5. The Captain will always be a licensed Thames Waterman and he or one of his crew will be available to help you board the boat and will also be able to answer any questions you may have. Do you have life jackets for everyone onboard? Yes, there are always more life jackets on board than the maximum number of passengers allowed, and some boats also carry a small number of life jackets for children. Will there be a safety announcement? Yes, the Captain always makes a safety announcement just prior to, or as the boat is leaving the pier, and we do ask that you listen carefully. In addition to pointing out the emergency exits the announcement will also contain information on where the life jackets are located and what to do in the event of an emergency. If you have any questions on the day however please do not hesitate to ask a crew member. Is it normally this rough / what if someone gets seasick? When you view the boat do not be surprised to find the boats rocking on the water, especially when other boats go past, this is usual and you will find that once the boat gets moving things smooth out considerably and you will hardly notice any movement at all. In 15 years of providing party boats for hire on the Thames we have never had a single case of sea sickness, and if you do start to feel queasy we would recommend laying off the wine for a bit to see if that helps! Yes, all boats have male and female toilets. While all our pleasure boats have large open decks for enjoying the best of the British weather, they also have spacious internal areas easily capable of holding all pasengers on board. Rain most definitely does not stop play at CPBS! Can we bring guide dogs? Registered assistance dogs are permitted onboard, please ensure they relieve themselves prior to boarding as we cannot stop for doggie toilet breaks. Do we have to tidy the boat after the function? No! All we ask is that you remember to take all your belongings, including any decorations you may have bought with you. Obviously if you really want to help with the hoovering then it'd be churlish to stop you...! When do we have to get off? The boat will return to the pier 15 minutes before the stated disembarkation time, the music will be lowered to background level and the bars will close. You then have 15 minutes to finish your drinks and leave the boat. For instance if your party is booked as a 7pm to 11pm, the boat will return to the pier at 10.45pm for an 11pm finish. Further charges may be incurred if all passengers do not embark in a timely fashion, please see the terms and conditions for further information. Someone left their coat / bag / mobile phone on the boat, who do we call? The boats are all cleaned immediately after a party and any lost property stored for 48 hours before being destroyed. If you are missing some property please therefore contact the office on 01689 89 89 59 as soon as possible and we will make arrangements for you to come and collect it. We have a comment / letter of thanks / complaint about the boat party, who should we speak to? We are always looking to improve our service and would love to hear your feedback after your party, you can contact the office on 01689 89 89 59, or by email to info@cpbs.co.uk. This is especially important if it is a complaint, after all if you don't tell us we won't know, but you can rest assured that if any complaints are bought to our attention we always investigate and try to put right immediately. If you have a complaint on the day of your function please speak to the Captain of the boat before the end of the function to help us resolve the issue as quickly and efficiently as possible. On the other side, it's always gratifying to know when we have got it right. Above all the old adage holds true, if you liked our service, please tell your friends, if you didn't, please tell us!